The geodes come from what is known as the Dugway Geode Beds in Western Utah. About 6 to 8 million years ago, volcanic activity in the area deposited an extrusive igneous rock called rhyolite. Gasses trapped in the rock formed hollow cavities, and millions of years of ground-water circulation allowed minerals to precipitate into the cavities forming crystals. The resulting crystal lined cavities are known as geodes. The most common mineral found in these geodes in clear quartz, though amethyst and rose quartz can also occur. 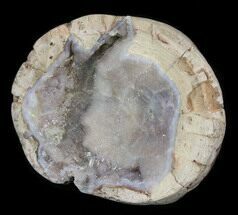 The geodes tend to be relatively small, average about the size of a baseball, though rare examples can be found up to a foot across.